The title says it all really. This masterpiece of automotive design and technorama was introduced exactly 40 years ago today at the Geneva auto show, and it's been making the world a slightly better place to be ever since... with brown SM detail pic to warm the cockles of Drew Smith, Ben Kraal, Davey Johnson, Mr Charmer, and all those other #browncar #LHMluv(er's) hearts. Alain De Botton’s withering description of Poundbury village – a recent extension to the town of Dorchester in Dorset, is typical of those made by both mainstream and architectural media following the opening of Prince Charles’s ‘model’ town. For many it is purely the architectural form that proves to be Poundbury’s undoing, but the most interesting aspect of this place – and what makes it a worthwhile study, is its urban design principles and attitude towards the car - both in terms of the theories and ideologies its designers used, and in the physical manifestation of the place itself. Poundbury exists today primarily thanks to HRH Prince Charles – the Duchy of Cornwall. His views on architecture, and how in turn the architecture profession has received this, can be read elsewhere. What specifically interested me was that Poundbury’s “…entire masterplan was based upon placing the pedestrian, and not the car, at the centre of the design.” To understand the relevance of Poundbury when considering the relationship between urban environments and the car, it is necessary though, not to focus on Poundbury’s visionary Prince Charles, but Leon Krier – Charles’s masterplanner, and New Urbanist. Poundbury embodies these ideals, situated approximately two kilometers from the heart of Dorchester town centre. In between the two is a less dense, greener, urban ‘strip’. The place is split into four quarters, being built in phases (currently only phases one and two have been completed). Each quarter comprises it’s own mini-centre - a square intended as a focal point, for people, rather than cars. Yet visiting Poundbury and observing how people actually live there, reveals deep flaws in Krier and Charles’ model. Poundbury feels like a village that has not yet been through the industrial revolution – yet (paradoxically) it feels dominated by the car. The central squares are not ‘people’ places - they are car parks. The streets around them are deserted of both people and vehicles. Ultimately, you discover the cars have been shoved out of the way, into back alley muses containing nothing but garages, eating up acres of space. The result is that both streets and courtyards are devoid of life and feel soulless. Walking through Poundbury is analogous to Jim Carey’s chatacter in the Truman show. Life feels somewhat fake. In part, this is unsurprising - The Truman show was based on and filmed in Seaside, Florida which was designed by the ‘fathers’ of New Urbanism – Andres Duany and Elizabeth Plater-Zyberk, and a place which Krier speaks about enthusiastically in his book. Richard Rogers argues that for a place to be truly ‘walkable’ one needs the ability to work, live, play, (by inference meet people, eat, shop, entertain and be entertained) within the same (1 mile or so?) area. Although Poundbury was developed as a mixed-use community, as one might expect, many of the people who live there do not work here, and vice-versa. Likewise, the keystone services and amenities taken for granted in cities and towns - the supermarket, cafes, bars, a cinema, restaurants, educational and academic institutions, gyms, theatres, a take-away, a library or bookshop – simply do not exist in Poundbury. Poundbury has a high end hi-fi store, three wedding and bridal shops, and a ‘Budgens’ mini-mart shop masquerading as “Poundbury Village Stores”. Bluntly, being denied the amenities modern people and modern life require, strangulates Poundbury. If the designers had truly wanted the residents of Poundbury to use their cars less, then would it not have been more pertinent to explore and create better links, pathways and services between two of the places which Poundbury residents might most frequently be predicted to need access – Dorchester and the nearby Tesco’s supermarket? The supermarket sits only 1.4 km away as the crow flies (fig.26), but there is no path, no route for pedestrians, or other vehicles - so almost everyone drives there, as the supermarket is just around the ring road. Dorchester itself is 1.6 km from Poundbury’s central square. These distances (around 1 mile), equate to around 20 minutes walking time - too great a distance and time to prevent time-pressed people from using their cars. Alternatives options to jumping in the car are needed, and they are notable by their absence. Yet somewhere between drawing board and physicality, things have gone wrong. Poundbury does feature narrow, winding streets with ‘dropped kerbs’ that seem to discourage cars drivers from traveling particularly quickly. At the same time however, its lack of real hierarchy and distinction in building types – and the apparent desire to completely remove street signage, or implement any technology – means that the place does, to use his words about certain other places “demonstrate [its] unique capacity to disorientate, confuse…” Poundbury isn’t readable; it isn’t legible to an outsider. Parking is worse still. The overarching desire to maintain ‘order’ – for everything, including the car – and to be neat and tidy, seems to have created issues when it comes to dealing with where to put stationary vehicles, and how much space they are allowed. Vast parking mews at the rear of houses tends to keep vehicles off the main road, but the benefit of this is questionable. The garage mews take up enormous space in the areas behind houses, occupying huge tracts of land that in ‘real’ cities simply isn’t there. Squares and courtyards have no focus, no life, and where there is some focus like a shop, simply become car parks. If the intention was to put pedestrians (or even cyclists and other small vehicles) first, Poundbury might have looked at employing the incredibly successful ‘Woonerf’ system seen in Holland – which limit the space for cars on residential streets – and makes the street-spaces vibrant, safe environments in which children can - and do - play. Might it not have been better to move the cars out to two, maybe three main ‘areas’ on the edge of the development? But then this would raise the prospect of creating multi-story car parks, which Krier criticizes for little good reason, but at great length, in what he has written. Poundbury is an interesting example of an attempt to build a new development in the early twenty-first century. 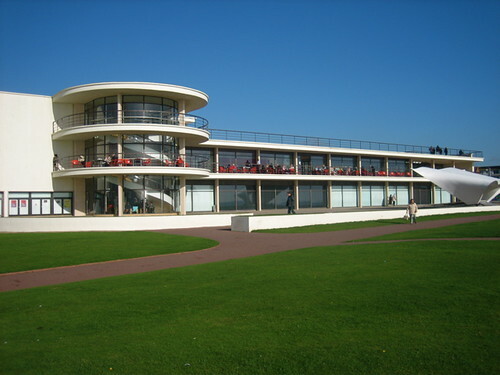 Objectively, its failure is not down to the plain-to-see distaste for modern, nee modernist architecture which its facades embody, and for which it is most commonly criticised. Instead it is the failure to provide any vision or any excitement, about how the future of urban environments might be, and how people and vehicles might move around and share space, that disappoints most. Worryingly, for a place that is intended as a counterpoint to sprawl and overcoming car dependency, Poundbury provides little in the way of a blueprint for how things could be done. It is also a lesson in why not to look at mobility as only being about cars, and why a creeping agenda of discouraging or limiting movement and mobility could be dangerous. Should others try to ape Poundbury’s developers, they too risk becoming preoccupied with trying to create well meaning solutions that don’t take into account the needs and desires of modern lives. One hope that if future developments try to counteract the car and its impact, they don’t forget about other forms of private mobility, which can complement or repurpose traditional cars. Sadly, for all the anti-car bluster, there is not a hint of a cycle lane, a bike park, a PRT system, a car-share scheme or a Segway to be found here. An opportunity has been missed here, because of a refusal to embrace and experiment with new ideas, technologies, and products. This place could, and should have been an exemplar or a test bed in how we might live and move in the future. Instead, what best encapsulates the failures of Poundbury is this: its inhabitants appear condemned to a life on Dorchester’s ringroad, traveling to a big-box Tesco’s store, built on a greenfield site, in a car that weighs twenty times their weight, and typically has three empty seats. One can only hope that those tasked with helping shape future towns and cities - both in the UK and abroad - who are now bussed to this place to ‘learn’ from it as some kind of example, recognise its failures and don’t condemn the inhabitants of their future towns to the same fate. This piece is an adaptation from part of Joseph Simpson's Thesis "The future of the car in the city" - Royal College of Art, June 2008. A full set of references for this piece are available on request, but are not included here in our usual hyperlink fashion as they mainly refer to offline sources. The piece is not creative commons licensed in the way our usual pieces are, as it is sibject to some copy right from The Royal College of Art. Please contact me if you would like to use or reference it so that I can grant permission. A copy of the original piece in pdf format is available on request. Nissan unveiled a strange-looking, oddly-named SUV today. And I love it. Sounds wrong on all sorts of levels? Probably, but the Juke - a segment-busting SUV that's roughly B-car (Fiesta) sized - makes sense for lots of reasons. Retaining the high driving position, butch styling of SUVs that people love, while junking the, erm, junk is a good start. But the best thing about it, is that - for the first time in a long time - a car maker has managed to get a concept car through to production without emasculating it into oblivion (looking at you Honda CR-Z). This is by far the most interesting thing in car design we've yet seen in 2010. For having the guts to be willfully weird, I hope for Nissan's sake that it sells like hot cakes. 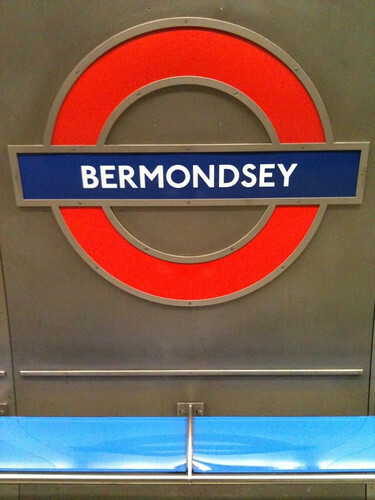 As I travelled this lunchtime from Bermondsey to New Barnet, to collect my car from the garage, I fancied snapping photos of the various places I changed transport. So here we go. Click 'continue reading' below to see the full set.